Vulture is speaking to the screenwriters behind 2014’s most acclaimed movies about the scenes they found most difficult to crack. Which pivotal sequences underwent the biggest transformations on their way from script to screen? 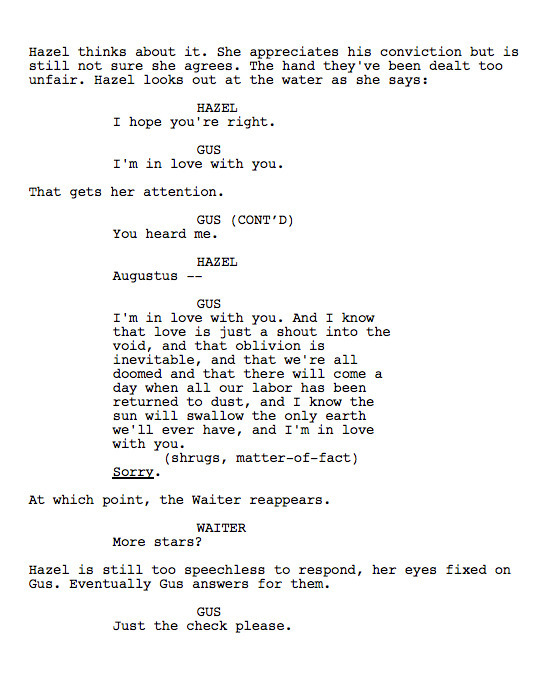 Today writers Scott Neustadter and Michael H. Weber discuss the sequence in their adaptation of John Green’s The Fault in Our Stars where Hazel (Shailene Woodley) and Gus (Ansel Egort) go out to dinner. The scene is then excerpted below. To cut a long story very short, Scott’s father died of pancreatic cancer the week The Fault in Our Stars was published. We read it a few weeks later, not long enough to have entirely processed our feelings on its subject matter but long enough to know that we had to adapt it. The book was heartfelt and funny, sad and beautiful, its dialogue simple and profound, its characters completely fleshed out on the page. It was an easy adaptation, as these things go, and in fact, we wrote it in less than a week, our primary objective to create the illusion of absolute faithfulness. You could say that no scene was difficult but, considering where our heads were at that time, the truth is they all were. Case in point, this scene below. Some of it drawn from John’s words, the rest from our own emotional unrest. 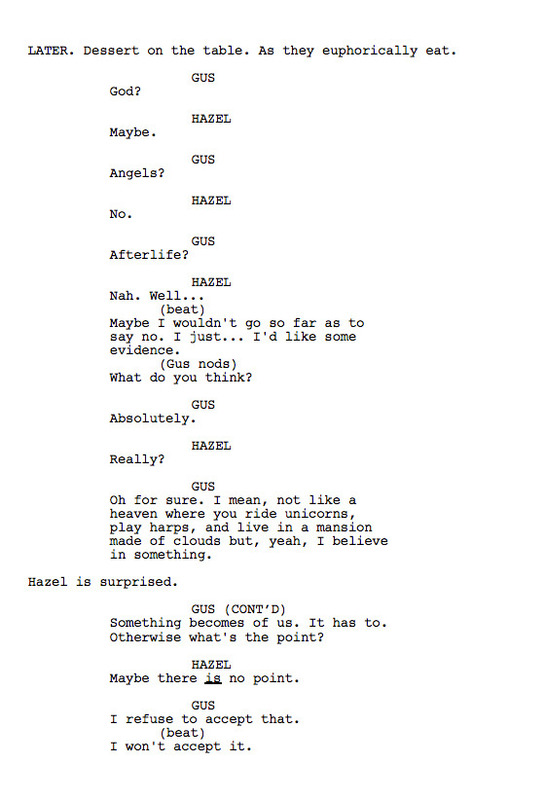 It’s a scene where Hazel (who knows she’s dying) and Gus (who knows he’s dying but hasn’t told Hazel yet) have traveled to Amsterdam for what they’re sure will be the trip of a lifetime. That first night in town, they’re treated to a five-star dinner in one of the city’s swankiest restaurants. Despite the romantic setting, finality is on their minds, as it so often is, and so their thoughts turn to the afterlife — what happens after you die? Is there more to the story? Will any of this suffering and sadness make sense? Big questions, big themes; not exactly your typical teenage dinner conversation. But these are not your typical teenagers. Though they live their lives refusing to let their disease define them, Hazel and Gus are also acutely aware of their need to accelerate a lifetime of experience into what little time is left. Something the rest of us never do. If there was one idea that characterized the entire adaptation, that was it.